SPOT System: Follow Us Live! 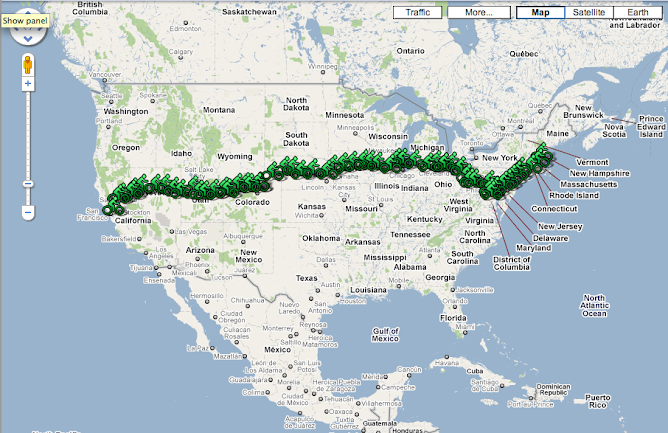 You can view the day-to-day schedule, terrain, mileage, and checkpoints by clicking on the map! We rolled out of Mesa State University around 7:30 this morning with the mindset that we would be working hard today, starting our climb into the Rockies. But, I think we were all pleasantly surprised that the day wasn't nearly as strenuous as we were expecting. Maybe because we've gotten that much better at biking, or maybe because we were expecting the worst, or probably the best option, the 3rd day through the Sierra Nevadas really was one of the hardest days we'll have on the trip and that's what we continue to compare everyday to. The 3,000 feet of climbing was steadily spread out over 90 miles. I was pretty surprised that we were still in some desert, until finally with 30 miles to go everything brightened up and the green returned (I think for good this time). We also were lucky to bike next to the Colorado River for a majority of the day. Unfortunately, we had some more flat tires and ran into some construction. At first, we felt like we were flying, as cars stood still in the bumper to bumper traffic. Then we hit the freshly asphalted area and ended up walking through the rest of the construction zone. Luckily we were close to the end of the zone and only ended up walking for about a mile. We are staying at the Glenwood Hot Springs Lodge in Glenwood Springs, CO, thanks to a generous Stanford alum. After checking in, we relaxed in the lodge's hot springs, which the legs greatly appreciated. We then took our time at dinner, sampling a wide range of food at Juicy Lucy's. I even tried a mussel. All these weird seafoods I've never even had the desire to try before, but if the opportunity presents itself (aka someone orders it and offers up a taste test), I have to seize it. Tomorrow will hold another chunk of climbing, pushing us further into the Rockies, ending our day in Vail, CO.
With only 40 miles ahead of us, we opted for a late start, so Mike and I headed to The Arches National Park for the morning. Arches National Park preserves many sandstone arches and other wild rock formations. The most famous formations are the Delicate Arch and the Balanced Rock, which we obviously scoped out. The views and other landscapes were gorgeous as well. The Delicate Arch required quite a hike to get an up-close view. Unfortunately, I didn't really realize we were going to be doing any hiking so I wore my flip flops...and on the hike back down, they broke. Figures. So I went barefoot for the last 30 minutes back to the car. I just kept thinking about the TOMS' One Day Without Shoes campaign, pretending it came around again and I was just participating in it again. No big deal, kind of funny looking back on it. We also got a far out view of the Delicate Arch from a viewing area. After our morning activities, we packed up the van and headed out to our starting point on I-70. It feels so weird to say that we have a short ride of 40 miles, when prior to this trip the longest ride I had ever done was 40 miles...and that was only 1 time...over a year ago. SO pretty much, I think I've adjusted to the mileage and have learned how to approach it mentally and physically. With today's ride we entered our fourth state, Colorado! I really can't believe we have already been through 3 states and are still forging on at full speed toward Boston, MA. But of course, I'll elaborate for you and share TONS of pictures from today. There's too many to choose from and I couldn't cut it back to just a few, so enjoy. So today, Shane, Zane, Sanford, Jason, and I went skydiving! It was AWESOME! I really kinda thought it'd be a one time thing, but I will definitely be going again (sometime). The day started off with some logistics, waivers, and training videos, and then we were set. Zane and Jason went first, I went next, and Shane and Sanford went third. The people there were obviously crazy, in a good way...I mean you kinda have to be to be a skydiving instructor for a living. But after today, I'm pretty convinced they're living the life. Before take-off, and the first of many thumbs-up. You get all suited up and hop in the plane with your tandem partner skydiving instructor. The plane ride was about 15-20 minutes, taking you up 10,000 feet (about 2 miles). The views were like no other. My jumping instructor, Ben, pointed out a ton of sites - all the different canyons, national parks, rivers, and whatever else popped up along the way. During the flight you also get all connected and hooked together so you're ready to go once you hit the right elevation. I was shocked I didn't get cold feet. But, I think I was so excited and had so much adrenaline going that not much could have phased me at that point. I think it also helped that Ben was clearly a pretty experienced jumper and I felt pretty safe and confident that he would get us back to the ground in one piece. He had just done his 4,000th jump before we got there. After some jokes, conversation, pictures, and pre-jump interviews, the time came to jump out of the plane..
WOW! What an unreal feeling. It's unlike anything I have ever experienced and there really are no words to describe it. It is DEFINITELY something I would recommend trying. So when the door popped open, Ben put his one foot out, I put my two feet on the platform, and from there the next thing I knew we were out and free falling at 120 mph. AH! I am literally trying to find words right now and I really can't. All I can say is WOW and that I loved it. I even got to steer the parachute for a bit on our way down, and we did some spirals too. Really, really amazing. I think you'll be able to tell in the pictures I was having a great time. I am soooo glad we decided to skydive. It was awesome. The extreme adventures didn't end there. After some rest and coming down from that rush, we all went on on a Hummer tour through some of the canyons from 7-9 pm. Now, I've been off roading before, but this was on a whole new level. I think I was still on some sort of adrenaline rush or another one started, but once again I was astounded. I cannot believe what these cars are capable of climbing up and driving through. And once again, knowing that this was our driver, Ammon's job and that he had been doing it professionally for 4 years, made me trust him quite a bit. The views were unbelievable again and we sat and watched another sunset from the canyons. He also provided us with a lot of history and theory behind the canyons and the surrounding areas. So if you're ever in Moab, UT hit up Skydive Moab 435.259.JUMP and High Point Tours. A huge thanks to all the guys at Skydive Moab - Instructors: Ben and Chris, Crew: Jordan and Eula, Pilot: David, and Eli who dealt with all the logistics. And another thanks to our Hummer driver Ammon who got us through the rock crawling portion of the day. Obviously today was a rest day and we'll pick up tomorrow on I-70 where the group left off on Sunday. But before we begin the trek to our next stop, Grand Junction, CO, we're still going to squeeze in a trip to the Arches National Park in the AM. Welp, it was my turn to drive again unfortunately. Zane put it perfectly, "When it's your turn to drive, you get shafted." And it's true. But the rotation continues on, and on we go. I had the out-of-commission riders, Shane and Claire with me today as my partners in crime. We drove into Moab, UT to find the perfect place for the next two nights while the other four biked their 60 miles. We had a few mishaps, like a spilled water cooler and 4 flat tires, but I think everyone was at least a little relieved when they saw their housing for the next two nights. Shane, Claire, and I went around town to different motels, hotels, hostels, and campsites to find the best set-up for the best deal. We were offered an amazing, amazing 4-bedroom condo at the Bowen Motel for a great bargain. It is really a nice place, and I think we'll have a great stay, especially after a good night sleep in some beds and fresh, clean clothes with our access to laundry. We'll spend the next 2 days here before we head to Grand Junction, CO on Tuesday. I'm really excited about all the activities Moab has to offer. We were pleasantly surprised to find a ton of stores, cafes, and adventure opportunities to say the least. We have a ton of options ranging from visiting the Arches National Park, Canyonland National Park, ATV rides, Hummer tours, night boat cruises on the Colorado River, or skydiving. And that's just to name a few. Tomorrow will be a pretty packed day trying to cram in as much as we can before we hit the road again. I think we're all pretty pumped to get in some extreme experiences outside of biking across the country. Claire, Mike, and I already explored a bit, checking out the local rock and fossil shop, which was quite interesting. I also hit up the local used and new book store and a bunch of little boutiques. Tonight we drove up to Arches National Park to watch the sunset (of course we'll still go back again when it's light to see all the sites close up). It was pretty amazing. The canyons are huge and breath-taking from far away, but when you walk up to them and even climb a little bit, they are astonishing. I don't think anyone can actually fathom how big they are. They're HUGE. After the sunset we drove to another pull off site in the park and stargazed for awhile. Really, really cool. You could see soooo many stars, unlike big cities where there are too many lights. I definitely could have slept out there if it weren't for the pesky mosquitos. We knew we had a long, tough day ahead of us, a 112 mile ride which was probably around 80% uphill (no exaggeration). I spoke too soon yesterday when I said we had hit green pastures again...we were back in the desert today, but with some new and different scenery - canyons. With a daunting task in front of us for the day we took off and knocked off the miles one by one. Or in groups of 10 miles. I think it goes by faster broken up like that, that's where my distance running mentality kicks in, intervals style. Daunting signs that remind you of the long trek ahead. The summit for the day! Mike and I obviously rode together again as usual, which was really nice on such a long day out on the road. I think we ended up on the road for a total of 10 hours, including cliff bar breaks, view area stops, lots of picture taking, and lunch. We're all starting to develop some nice farmers' tans from our bike gear. I think the weirdest ones are the glove tan-lines since I have a line at my wrist and on all of my fingers about half way down. We all are getting raccoon eyes from our sunglasses, sock lines, and Mike is sporting the best one yet, bib tan-lines. I fell again today thanks to my new favorite thing out on the road...GRAVEL! Luckily I was only going like 2 miles per hour when I hit the loose rocks so the spill wasn't too bad. I didn't really get any cuts, but my poor bike (who is still embarrassingly without a name) got a little beat up. But no worries, it was just a part that can be twisted back into place and is already repaired. Due to these types of clumsy acts, which can probably be attributed to my new found confidence in clipping in and out, I seem to always end up the dirtiest at the end of the day, covered in chain grease. Thumbs way down for a twisted handlebar and tons of bike grease on my legs from the spill. Anyways, even though the ride was long, tough, and extremely hot, it was pretty sweet. We saw a lot of new, cool things today and took advantage of seeing sites while we took our breaks. We rode through canyons today, and they were amazing. They were gorgeous. Huge, randomly shaped, and bright red, which looked especially neat contrasted with the bright blue sky and big white clouds. The biggest treat was at mile 86, a 6 mile downhill through some amazing, amazing parts of the canyon. That little stretch got me through the rest of the ride, with only about 20 miles left. The best part of seeing things like this, things that you have never seen before, is the smile it brings to your face, a smile that is out of pure astonishment and wonder at what lies before you. I am not used to seeing things like mountains and canyons and they truly do amaze me, and I stare and smile in awe. I am so thankful to have the opportunity to see these things in person, because even though I try, there is no way a picture can capture what I've seen. They'll only bring back the memories. We like these signs after climbs. One of the amazing sites on our downhill stretch. At one of the viewing area stops. There was a whole field of yellow and pink flowers...and then I realized they were cacti! We made it to Green River, UT. Another huge feat and great effort. Before I hit the hay for the night, I'm sitting and watching the sunset, a perfect end to the day. I wish you could all see through my eyes right now, the colors are unbelievable. With that picture in mind, I'm sure I'll sleep well in our new hometown for the night. We opted to cancel the Grand Canyon detour once we figured out it was a 7+ hour drive. So tomorrow's plans are still up in the air, as we are a day ahead of schedule. And lastly, a huge thanks to Dave Evans, a rider from last year's Ride Against AIDS, for his suggestion to adjust my seat to save my knees. AND IT WORKED. I raised my seat a bit and I can honestly say it helped a ton and I think (cross my fingers) they'll be back to normal in a day or two. SO happy about that!